Kat - As a child I would often be dragged out into the local forest to walk the dogs. And, inevitably, I'd end up blundering into some stinging nettles. As soon as I got stung, my mum would delve into the undergrowth in search of a dock leaf to rub on the reddening bumps coming up on my pale legs. But does this actually kill the sting? Before we find out, let's take a step back and see how nettles actually cause their stings. Their leaves are covered in a multitude of tiny hollow needle-like hairs made of silica - the same stuff that glass is made of. When someone like me brushes up against a plant, the tips of these fragile hairs break off, piercing the skin and injecting a cocktail of nasty chemicals. One of these if formic acid, which is also found in ant bites. Getting concentrated formic acid on the skin can cause severe irritation, pain and blistering, so it was originally thought to be the major culprit responsible for the pain and misery of nettle stings. But it turns out that the levels of formic acid in the delicate hairs are too low to cause this kind of reaction. There are other acids in the stings too - such as oxalic acid and tartaric acid, found in other types of plants. For example, rhubarb leaves are a potent source of oxalic acid, which can be toxic in high doses. but, like formic acid, they're present at relatively low doses. So what else is in there that could be responsible for the pain and misery of a nettle sting? The other prime candidates are three chemicals known as histamine, acetylcholine and serotonin, which are all naturally produced in the body. To take a look at each of them in turn, serotonin is produced by nerve cells, and is usually associated with transmitting pleasurable sensations by signalling between nerve cells. But when injected by a nettle leaf, it has much more painful results as it irritates the skin. next is acetylcholine, another chemical that usually transmits signals between nerve cells. Again, when injected directly into the skin by a nettle's barbs, the sensation is far from pleasant. Perhaps the major culprit is histamine, responsible for triggering pain and inflammation, as well as allergic reactions. That's why people take anti-histamines for allergy-related symptoms, such as skin rashes, wheezing and snuffling. So this is probably one of the prime reasons that nettle stings quickly redden, itch and swell - and also suggests that antihistamine cream might work to relieve the pain. But the skin reaction is probably not just down to a single molecule, but the effects of all the nasty things mixed together, so it's a complex issue. Now on to the main question - does rubbing a dock leaf on a nettle sting make it better? Sadly for my childhood knees, the answer is no. 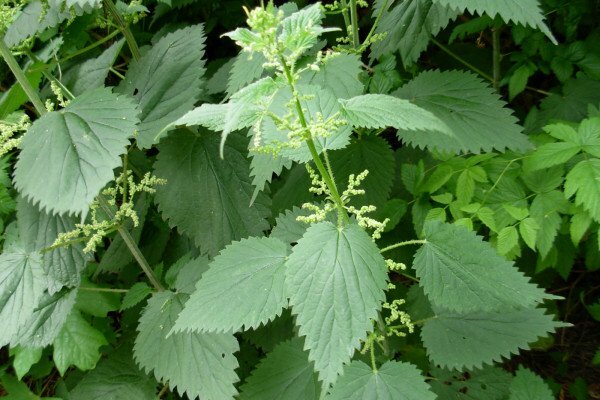 There have been various claims that the sap in the soft, leafy plant is alkaline, and helps to neutralise the formic acid and other acids in the nettle sting. But the acids are only a small part of the problem, and dock leaves aren't even actually alkaline. So that's definitely not true. There are other claims that they contain natural antihistamines, but there's no evidence to prove that's real either. In fact, it's more likely that dock leaves are just a placebo - creating a distraction from the pain of the sting through the rubbing action of a cool leave on the sore red bumps.